In this section of our website you will find some of the basic information that you need to know about the facility’s swimming pool, locker rooms, fitness center, laundry facility, meeting room and Property Owner Information Office. 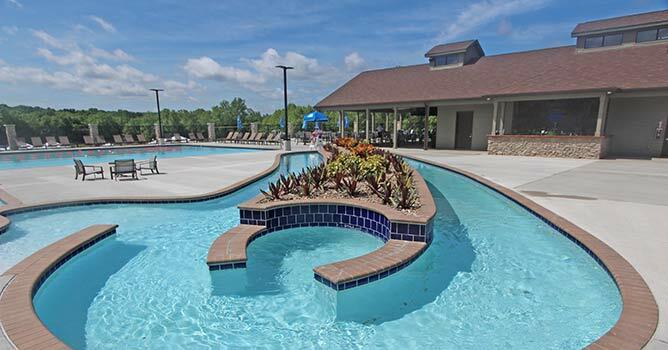 Cool down as the summer heats up at Innsbrook’s zero-entry swimming pool at Charrette Creek Commons! The swimming pool is approximately 50 feet by 80 feet and four feet deep, so you’ll have plenty of room to practice your breast stroke or just splash around. Take a relaxing journey around the lazy river or enjoy the array of comfortable and chic lounge furniture on the pool deck. You can also take advantage of the early morning swim sessions when we’ll have swim lanes open for a great full-body workout. Swim at your own risk when no lifeguards are on duty. The Summerhaus is the poolside eatery opened in 2016. Its outdoor seating area overlooks the beautiful new amphitheater and lake, as well as the pool facilities. Don’t leave the pool without stopping by for a refreshing summer snack that will give you an energy boost after an exhilarating dip in the cool pool waters! 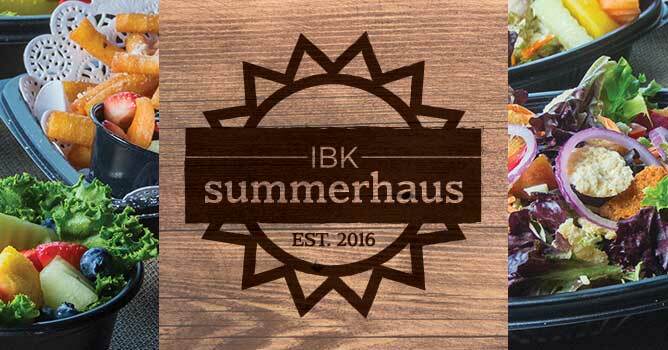 Whether you’re training for a marathon, trying to drop a few pounds or just livin’ it up poolside, the Summerhaus menu offers something for everyone. Refreshing wraps, hearty sandwiches, crisp salads and just three words—funnel cake fries—are a few of the menu items you’ll be able to choose from this summer. We’ll have beef and bratwurst burgers on the grill, along with concessions favorites like popcorn and ice cream. For the “big kids” over 21 years of age, we’ll have a plenty of refreshing drink options. Break a sweat and meet your fitness goals at Innsbrook’s fitness center. It can be difficult to maintain a fitness routine on the weekends — you’re at your lake house, your schedule’s off and your eating habits change. 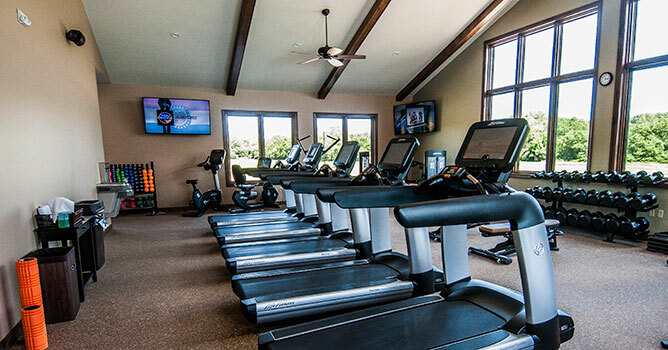 Whether you’re only with us in your vacation chalet on the weekends or you live in Innsbrook year-round — we want to help you maintain your health and fitness goals! The main feature of the children's playground, opened in 2016, is a large, life-like, two-story tree structure to climb on, in and around! There is also equipment geared for use by younger kids, like a log tunnel to crawl over and through. 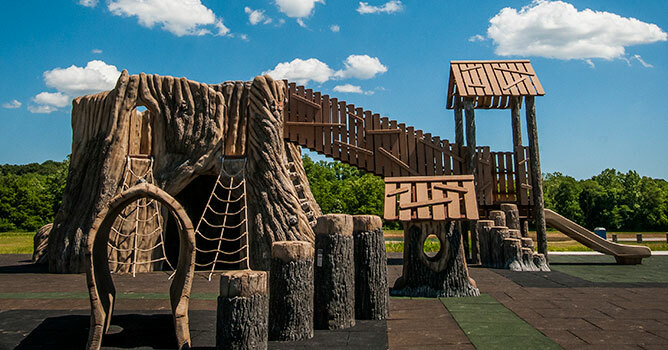 A special touch — designed exclusively for our property owners and their children and grandchildren — is a number of life-like, 3D animals hidden throughout the playground, including lizards, a fox, squirrels and more! See how many you can find. 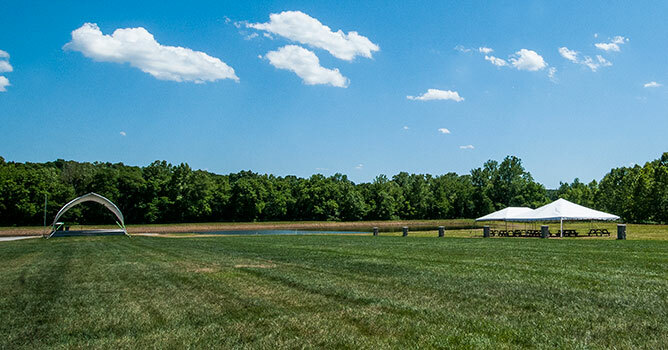 In 2016, we inaugurated our new Summer Breeze stage at the outdoor amphitheater at Charrette Creek Commons. Permanent, indoor men’s and women’s restroom facilities are located in the West building (the same building that houses the Summerhaus). Please click here to see important information on concert parking. Men’s and women’s locker rooms at Charrette Creek Commons contain lockers for property owners to store belongings while using the pool or Fitness Center. Property owners need to supply their own locks — Innsbrook does not have locks available for rent. The laundry facilities featuring two coin-operated washers and dryers are open during regular Fitness Center hours for the use of property owners and registered guests. Detergent is also available for a fee. The meeting/event room is available for property owners to reserve for Innsbrook club meetings, etc. This space is open to all owners and can be reserved on a first-come, first serve basis. This room is also available to rent for birthdays and other private events. Call ext. 9180 for pricing and availability. Charrette Creek Commons is the main hub for property owner information and activities. The offices of Innsbrook Owners’ Association (IOA) Office Manager Karen Denson and IOA Activities Director MacKenzie Justis that were previously located in the Property Management Building are now located in the East Building at the Commons. When you have questions about or need to pick up car/boat/recreational stickers or phone directories, general inquiries, questions about registering for kids’ camps and summer workshops, building permits, tarp purchases, bill payments, lost and found and of course anything concerning the facilities at Charrette Creek Commons, you will need to see Karen and/or MacKenzie in the East Building. Call ext. 9180 to reach Karen Denson for property owner information and ext. 9213 for MacKenzie in activities. Have questions about the pool or Charrette Creek Commons? Please call 636.928.3366 x9180 or email information@innsbrook-resort.com.